Maryland Cabling Contractors | Fiber Plus Inc.
FiberPlus offers a variety of structured cable plant solutions. Some of the most popular include voice/data, wireless, data center, outside plant, CATV, outside plant, pa/paging systems, distributed antenna, and passive optical networks (PONs) cabling. For these systems we utilize various types of cables, including single-mode and multi-mode fiber optic cable, category 5e, 6 and 6A, coaxial, and outside plant cables. Everyone and everyplace must have some type of media that allows them to communicate both internally and externally. 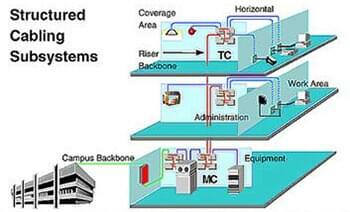 At FiberPlus, we can help you design, build, maintain, and service the right system for your environment. Our experienced Registered Communication Distribution Designer (RCDDs) are able to consult with you, your IT and facilities teams before you’re ready to construct or renovate your structured cable system and can provide the best solution for you and your company.